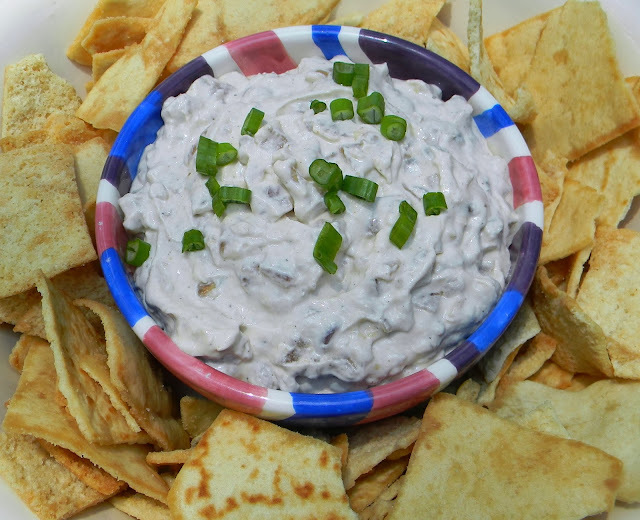 I think few recipes are more useful than a dip that goes with just about anything. A good, versatile dip will go with chips, veggies, crackers or any other socially acceptable method of spooning it into your mouth. It would probably not be wise to only use your fingers to eat this dip…well in public anyway. At midnight, alone and in front of your fridge while the dog goes outside to pee? Sure, why not! Not that I have ANY experience with that scenario. Ever. In a large sauté pan melt the butter over medium-low heat. Slice the onions evenly and add to the pan. Cover and simmer 25-40 minutes, stirring occasionally. If the pan gets too dry, add more butter as needed. Once the onions are completely caramelized, remove from heat. Drain off any excess butter and allow to cool completely. In a large mixing bowl, combine sour cream, garlic powder, soy sauce and Worcestershire sauce. Stir in onions and let sit in the refrigerator for approx 4 hours. When ready to serve, stir dip and taste for flavor. Add salt and pepper if needed. Is it just me or did we skip from winter right into summer? The high this week is going to be 87 degrees. April is usually one of the best weather months in Tampa with highs in the upper 70’s to low 80’s, but upper 80’s? Ugh. This cheesecake is perfect for spring and summer. It gets a lovely raspberry flavor from not only fresh raspberries but raspberry liquor as well. (Booze makes everything better!) The overall flavor isn’t too sweet and doesn’t wallop you over the head. It has just the right balance of sweet, tart and cream. In a medium bowl combine crushed graham crackers, sugar and melted butter. Mix together until cracker crumbs absorb the butter and are moist. Press into the bottom of a 9” or 10” springform pan and up the sides about ¾ the way up. Bake for 10 minutes and then set aside. Puree raspberries in a blender or food processor then run through a strainer to remove seeds. Set aside. In a large bowl mix together cream cheese and vanilla. Beat with a mixer until smooth and creamy. Next add sugar, sour cream, liquor and mix well. Then add eggs one at a time and mix slowly until just fully incorporated. Finally stir in cream and raspberry puree. Pour filling into crust and bake for 40-55 minutes or until center still slightly jiggles. Remove from oven and let come to room temperature, then refrigerate until fully chilled. About 4-5 hours. Once cheesecake is fully chilled run a knife around the edge to loosen, then remove springform pan and serve. When I first started cooking I struggled with new ideas for pork recipes. That doesn't seem to be the case anymore. Is it overkill to buy 4 new ones every year? In my defense I tossed about 5 of my old ones a few months ago. I’d really just be replacing those. So this recipe is delicious and I suggest you make it now before it REALLY is bikini time and you won’t want something that is fried a little and filled with a tasty cheesy center.